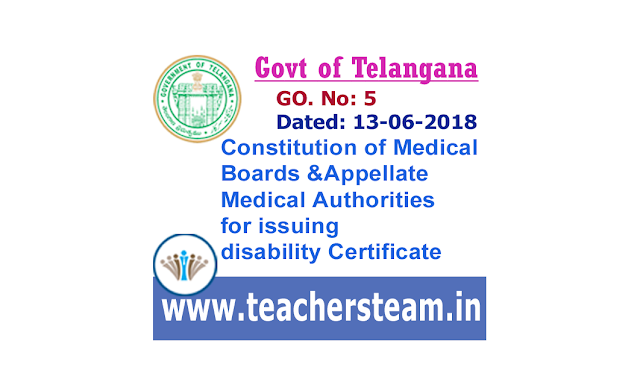 Department for Women, Children, Disabled and Senior Citizens-Constitution of Medical Boards and Appellate Medical Authorities for issuing disability Certificate- Guidelines for evaluation of various disabilities and Procedure for Certification- Comprehensive – orders - Issued. comprehensive orders were issued for evaluation of various disabilities and procedure for certification and constituting Medical Boards for assessing degree of disability of persons with Disabilities and Appellate Medical Boards duly adopting the guidelines issued by the Government of India under Persons with Disabilities Act, 1995. The Government of India has notified the guidelines for evaluation and assessment of various disabilities in persons included under Section 56th of the Rights of Persons with Disabilities Act, 2016 and procedure for certification after having considered the recommendations of the Ministry of Health and Family Welfare by superseding the existing guidelines under PwD Act, 1995.
procedure for certification duly adopting the guidelines issued by Ministry of Social Justice and Empowerment, Government of India. Deaf and hard of hearing and speech and language disability. Intellectual disability and specific learning disabilities. Disability caused due to Chronic neurological conditions. Disability caused Blood disorder i.e., hemophilia, thalassemia and sickle cell disease. Government hereby constitute the Medical Boards/Certifying authority for certification of all disabilities mentioned in RPwD Act, 2016 and all the District Head quarter/Government teaching Hospitals are hereby notified as District Medical Boards and authorized to give certificates for Persons with Disabilities as shown in the GO.